Weather will be fine and sunny with temperatures around 22 to 24°C, up until the last stage where it will be cloudy with a chance of rain and cooler at 18°C. It doesn’t look like being too windy for the first 3 stages, but it is forecast to reach around to 18 to 22 km/h from a southerly direction as the week progresses. One of two stage races starting this week, and they couldn’t be more different from each other. This is flat as flat can be, whereas the Tour Cycliste Féminin International de l’Ardèche starting on Thursday is one of the rarer mountain botherer races in the calender. It’s the Boels Ladies Tour that’s attracted the big teams (not all though, Cervelo Bigla are notably absent) and the TTT on stage 2 will stack the odds in a few teams favour for the GC. Canyon SRAM won last year with Brennauer, but it’s Worrack who is their leader this time. They seem very sure of their chances, especially considering how disappointing they were at the TTT in Vårgårda (albeit a much longer course). With Cecchini, Kroger, Guarischi and Amialiusik they look to have a speedier team, Cecchini in particular just missing out at Plouay Bretagne last week. Wiggle H5 look like they will be hunting stage wins and/or the points jersey here. D’hoore, Pieters, Johansson and Hosking with Cordon Ragot make a formidible team. Riders who have come from Rio seem to have one bad race and then get back on track, so it’ll be interesting to see how D’hoore and Johansson do. D’hoore won 2 stages last year but was shut out of the GC race by the ITT. It might be closer this year, so she seems their best bet for a podium finish. RaboLiv have last years runner up and 4th place in Brand. Along with van der Breggen and Knetemann, she has signed for another team in 2017. Gillow, Koster, Korevaar and Niewiadoma remain, although the way things are going perhaps they will be moving soon. A melancholy time for RaboLiv, hard to know if it will affect them. They shouldn’t fall too far behind during the TTT, but if so then Niewiadoma and Brand have got some stage wins in them. Boels Dolmans have Armitstead, Blaak, van Dijk, Canuel, Majerus and Dideriksen. Van Dijk was 3rd last year, but Majerus had a more consistent race last year. Orica AIS have Spratt and Garfoot, who both made it to the final bunch sprint at Plouay Bretagne. They have Elvin, Rowney, Roy and Wiles to complete their line up. Liv Plantur bring Kirchmann for the sprints, with Markus, Mustonen, Slik, Soek and Stijns. Hitec bring Kitchen and Moberg, with Thorsen, Frapporti, Guderzo and Hatteland. 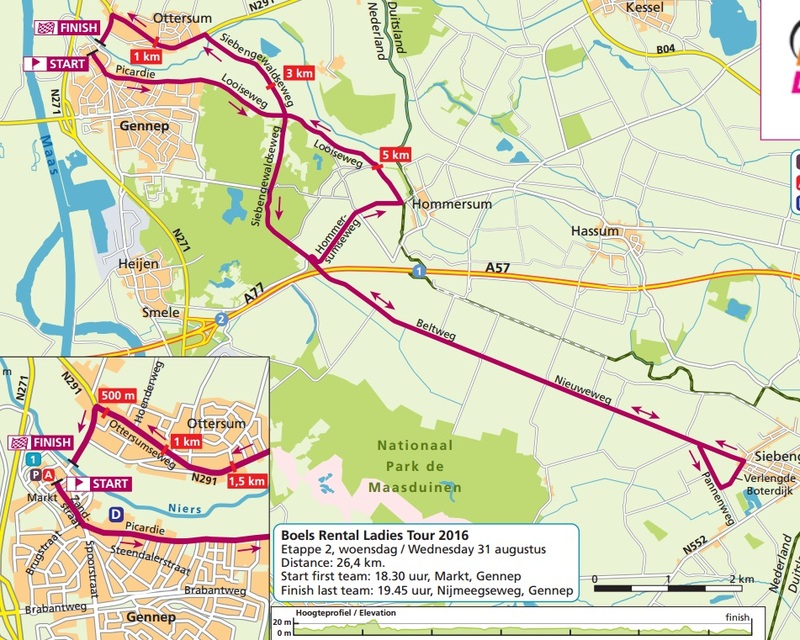 Lotto Soudal Ladies have Kopecky, who might surprise, along with Rijff, Knol, Hoffmann, Zorzi and Beckers. Parkhotel Valkenburg bring Ensing with van Gogh, Post, Stougje, Tromp and Solovey. Lensworld zannata did well at the Prudential Ride London GP with a 2nd place for Kessler. Confalonieri, Arzuffi, Spoor, Kozonchuk and Hannes make up the team. Jan van Arckel, NWVG Autoschade Bathoorn, Restore, Swaboladies and the national team of Noway complete the start list. Barring a catastrophe, the TTT should give Boels a head start and I think Majerus will fight it out with Worrack for the GC.